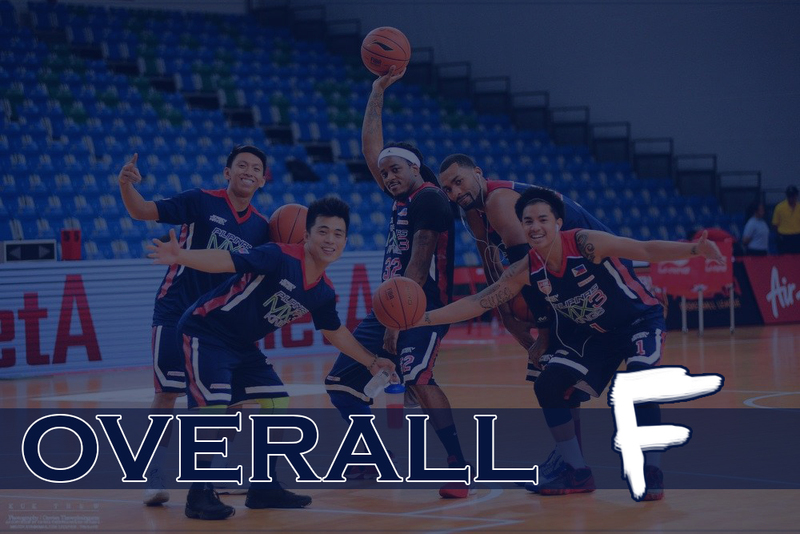 Now that the ASEAN Basketball Season 6 is over in the elimination round stages, we will take this time to take this time to take a look back at the seasons of all six ABL teams. Here’s the season review for the Pilipinas MX3 Kings. The Mindanao Aguilas/Pacquiao Powervit Pilipinas Aguilas/Pilipinas MX3 Kings was a trainwreck. Only it was a head on collision at the train station central between 8 trains carrying nuclear warheads. It seriously was that bad. The team started out strong though. They didn’t waver despite being left the only Philippines left in the competition after Racal Motors withdrew. They were being backed by Manny Pacquiao! They were going to bring life to Mindanao once again! They signed recent PBA Champion, AZ Reid, as their import along with Charles Mammie! They got up and coming Fil-Ams in Jerramy King and Alli Austria as their Heritage Imports! They brought in 2-time MVP, Willie Miller, to lead a team of former PBA players and some young PBA hopefuls! They won their first game in front of an unbelievable home crowd in style! I would say thing went downhill from there, but that would be an understatement. A more precise saying would probably be “they fell off the cliff entirely”. The Kings would only play one game in Mindanao before it was probably agreed that the travel for other team to get there might have been a bit too much. So they moved to San Juan Gym, which was relatively easier to get to for away teams but the the facilities were quite below standards. If only the problems were venue issues. Internal conflicts left Manny Pacquiao’s side to leave the team which led to renaming and rebranding. Personally, I am very grateful for this sequence of events, as it led to the team changing their team logo to a King Angry Mangosteen (which is word for word what they actually call him). But the problems didn’t stop there for the Kings. 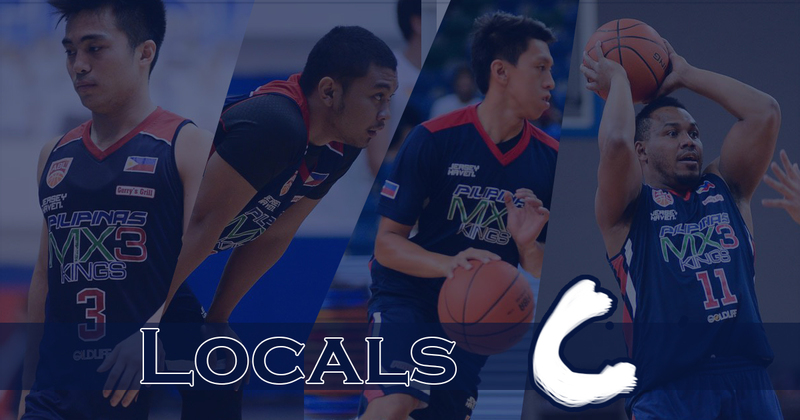 Financial issues were reportedly starting to pop up which led to the departure of Sunday Salvacion, Jondan Salvador, Chad Alonzo, and Carlo Sharma, Adrian Celeda, and Emmer Oreta. They dropped Charles Mammie 5 games into the season which was at worst 4 games later than they should have and brought in former ABL World Import MVP, Nakia Miller. Jason Deutchman would come on board as a local as well. But the Kings never really got anything going their way. After their debut victory, they went on a depressing 11 game losing streak by an average -15.2 point margin. Not exactly the stuff champions are made of. There was a blip of hope when they almost beat the league-leading Singapore Slingers in OCBC Arena. 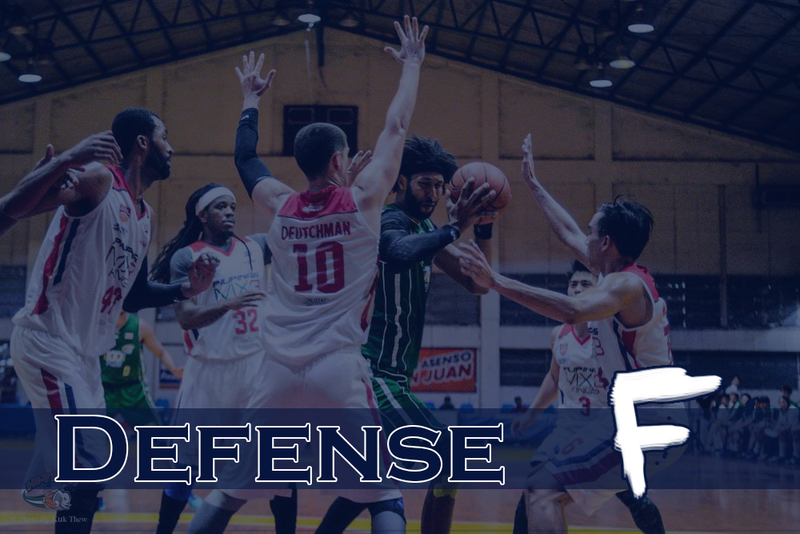 Nico Elorde hit a late 3 point shot to put the Kings up by one, but the Kings defense allowed a buzzer-beating shot by Kris Rosales that took the game into overtime where the Kings eventually lost. The losing streak would be broken on one random Sunday night in Ho Chi Minh City where the Kings beat the Saigon Heat by 20. I don’t think I have ever been so surprised learning about a result of a basketball game as much as that one. Even though the Kings were unable to grab another win after that, they seemed to have made strides forward to looking more and more like a functional basketball team. The Kings management clashed with imports, Nakiea Miller and AZ Reid (or more specifically, their agent), and it led to both sides parting way before the roster change deadline. The Kings tried to use Nigerian Import, Olaide Adeogun, but ran into problems with passport issues which led them signing ex-Mono Vampire, Michael Fey, who was also released before the end of the deadline. We’ll talk more about him in the “Imports” grading section. With the changes, the Kings looked hopeful for the future. They had a stretch of 3 consecutive games where they didn’t lose by double digits, which would be the first time ever this season. They ended the season losing to the KL Dragons on the Malaysian side’s Filipino Heritage day, which is probably symbolism for something comical. The Pilipinas Kings probably went through every bad thing that a basketball team could have gone through. Now that the dust has settled, it’s just up to them to pick up the pieces and start building a new future. AZ Reid is uber-talented. He could have possibly been the best import in the ABL ever. If he wanted to. Or if he even decided to make it look like he wanted to. Instead, we got to see the dread-locked monster of the PBA blast away 6.9 three point shots a game while only converting 16.5% of them. I understand that there could have been financial issues that played into his performance, but I just write what I know. And AZ Reid played very bad in this ABL season. And it ruined the Pilipinas MX3 Kings offense. The Kings finished the season shooting a miserable 37.8% from the field, lowest among ABL teams this season. They had the league’s lowest assists per game (14.7) and lowest assist rate (50.8%) as well, so I don’t think I would have been too harsh to give them an “F”. There are plenty of more factors that might have led the Kings to be come a higher-scoring, more-efficient team but the numbers paint quite a picture already. The biggest change, in my opinion, was the defensive hustle of Creekmore. With that change, the team was able to take more advantage from fastbreak situations where the Filipino locals excel in finishing. They might have been unable to pick up another win, but the improvement they showed were enough to push them up half a grade here. I wish I had better things to say about the MX3 Kings defense like I had tried to input some positive perspectives about their offense. However, the Kings just never really did anything well on defense. I honestly think it’s because defense requires more of a team effort than offense does to excel, and being a “team” is something the Kings struggled all year-long. The Kings gave up 87.2 points per game (league worst) while allowing opponents to shoot 44.7% from the field (again, league worst). Guards like Elorde, Salamat, and Gamboa were pesky enough to keep the Kings forced turnovers rate at a decent 18.7%. But their problem was always the interior defense. Charles Mammie was never tall enough to stop the imports. Nakiea Miller was an upgrade, but he was still only one man and the exodus of local players left him as the only true big man in the roster. Once they changed out Nakiea Miller, the Kings were left with only Creekmore inside the paint and opposing teams took advantage of that. The Kings went from averaging 85.1 allowed points per game to 93.4 allowed points per game after the import switch. They had already been allowing a painful 43.6% from the field with Reid/Miller and it went up to a blistering 48.0% once they got Creekmore/Fey. They had a good defensive perimeter unit in hand, but could never figure out how to patch it up inside. It’s true. AZ Reid led the ABL in scoring during his 15 game stint with the Kings. But let’s take a look at how he got there. Reid had the highest usage rate in the league (36.0%) took the most shots per game (25.7), and took the 6th most three-point shots per game (6.9). It’s hard to not lead the league in scoring at that rate of firing the trigger. Let’s put Matthew Wright’s efficiency (45.0 FG%, 41.8 3P%) into Reid’s attempts and we would get Matthew Wright scoring 26.0 points without accounting for free throws. Enough about AZ Reid. He was a good signing on paper, that never worked out on the court (probably because of off-the-court issues). And then there was Charles Mammie who cloaked the fact that he didn’t have the size nor polish to keep up with the other World Imports. He would be replaced by Nakiea Miller who was an upgrade on both offense and defense. Miller didn’t use many possessions (18.5% Usage) but he was an efficient enough scorer (48.7 eFG%) and a decent shot blocker (6.8 BLK%). He also shot a decent percentage from deep (31.8%) which made him a pretty good stretch 4. But that’s the thing, the Kings didn’t need that from Miller. They needed a dominant inside presence. It took them 15 games to clean up the mess, but when they finally did and signed Creekmore, things got better as mentioned in the section above. He and Nakiea Miller’s slight production are the reason that kept this grade above an “F”. It would have been better if the Kings had nailed their second replacement import, but Adeogun never saw a second of playing time in the ABL and Mike Fey didn’t turn out to be that good. I almost forgot to mention the Heritage imports, Alli Austria and Jerramy King, which should say enough about their impact on this team. Whether they didn’t get enough playing time or didn’t earn enough playing time is left to be decided another day. 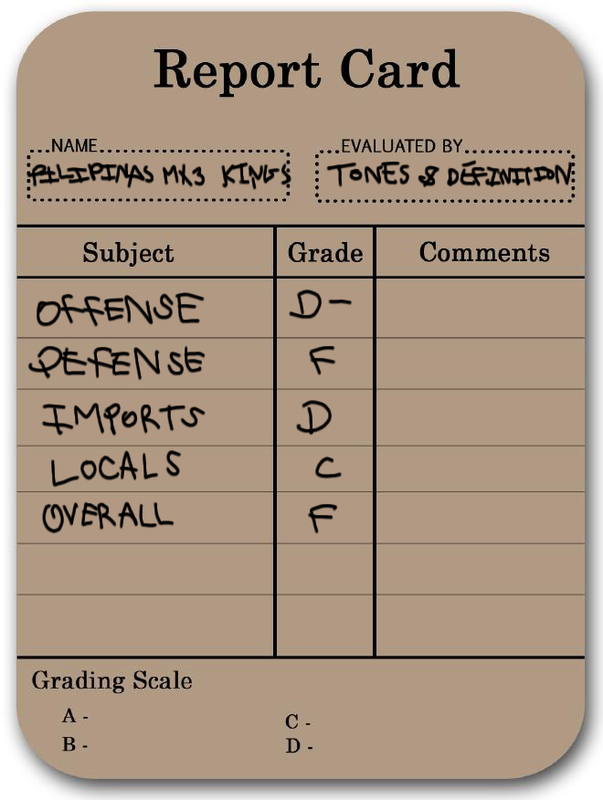 I pity for the locals of the Kings. Their team’s record made it hard for fans to actually acknowledge how good they were. I loved their guard rotation. But that’s where Eric Salamat, Nico Elorde, and Mike Gamboa comes in. The three-headed defensive monster reigned terror on opposing guards, combining 3.3 steals per game among themselves. The three also combined for 18.7 points per game. If the Kings can keep this core of guard play into next season, I’d see a better future for them. The rest of the local roster was too inconsistent to be of any impact. The wings who lasted the season (Sam Marata, Jason Deutchman, Val Acuna) rarely found their scoring rhythm and the only wing that played really well (Sunday Salvacion) was among one of the boughtout players. It would have been fun to see what the Kings could have done with some inside bench players, but Carlo Sharma and Jondan Salvador made sure we didn’t get to see that. Filipino basketball fans either shook their heads in embarrassment or shrugged off the team altogether, which should be very concerning if you are a basketball team in the Philippines. Their play didn’t inspire anyone despite being the most crazed basketball nation per capita. But this should be the rock bottom for this team. Should they return for next season, I feel like they can make lots of improvement, especially if they retain their guard core. Alll they need is to clear up their management off-the-court and let the Pinoy Pride Passion on-the-court do it’s thing. They have a good core in the backcourt but the problem now is whether they can convince anyone to play for them next season. It was easy to sell you into playing for this team at the start of this season as you were judging a blank canvas. 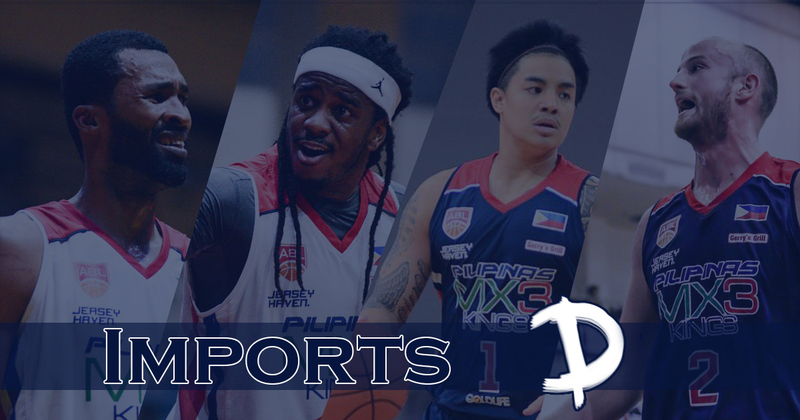 Going into next season, the team management will have the hard task of selling players to play for a team that some consider the laughingstock of Filipino basketball. That’s going to be a steep hill to climb for MX3. It is a sin to consider a team or a player based on reputation. A sin which I committed and feeling it’s karmic wrath right now. The players, the coaching staff, and the team management among others know how to manage what they do. Aguilas will have Charles Mammie as their tallest player at 6’7” and he’ll have to clash with the likes of Chris Charles, Steve Thomas, Justin Howard, Reggie Johnson, Lenny Daniel, Anthony McClain, Quincy Okolie, and Calvin Godfrey. Not exactly easy work to do. At least I got this right. They are not completely unbeatable, but they will be hard to beat. I see a 14-15 win season for them up ahead.